You need to match 3 or more objects by exchanging two pieces in a horizontal or vertical direction. Matched pieces are removed from the board and new pieces dropped back onto the board. The object is to clear the board and advance to the next level. Match four or more pieces to earn special power ups. 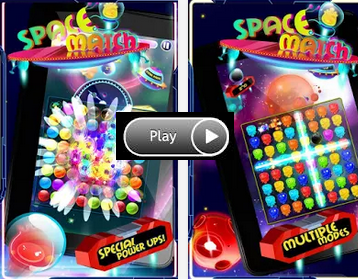 Match pieces to score enough points to beat the target score displayed at the top right of the screen. As you score points, the target score is reduced. When it reaches zero, you have completed the level and a new target score challenge is set. Keep an eye on the progress bar to gauge how well you are doing, but don't hang around, you're playing against the timer! This is a very challenging mode where you will need to concentrate and keep your wits about you. The mission is straightforward, match pieces on the board to create space rocks. Match three space rocks of the same color to remove them from the board. Later levels have you matching space rocks of one color to create rocks of a different color.